I love those precious moments when I’m able to make something with my kids at my side (preferably without any tears or tantrums). The other day when my four year old was helping me cook, she leaned over and gave me a big hug and said, “Mom, I just love helping you cook”. Let’s work on making more of these memories. 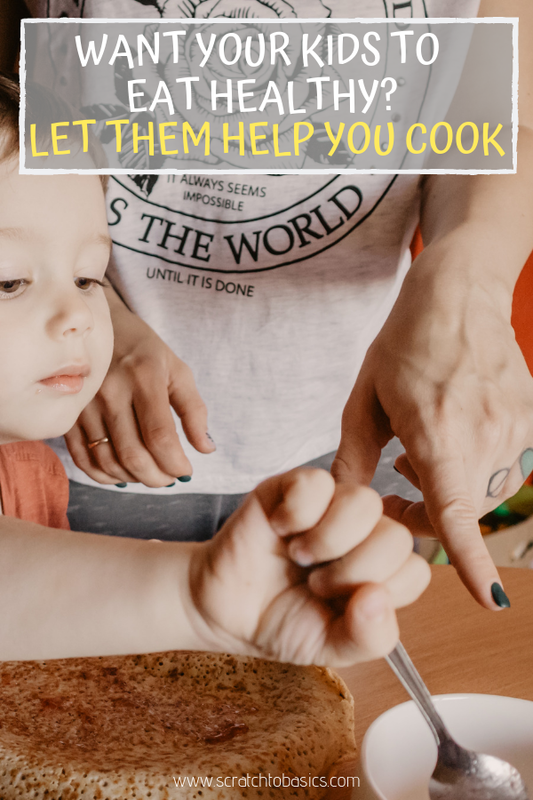 I’ve searched the internet and compiled some awesome tools to help any parent cook with their kids. Just click on the links to see more information about the items. This list is geared towards younger kids who shouldn’t hold sharp knives, or be too close to a hot stove or oven. Why Bother Cooking With Kids? Maybe you’ve got your own rhythm going when it comes to meal prep. And letting your kids help sounds like it would be more of an annoyance than than a fun activity. Here are a few benefits to bringing the kids into the kitchen with you. If kids help prepare the food in the kitchen, they might actually eat the food at the table. Fewer tantrums at the dinner table sounds pretty great, right? It provides teachable moments to explain where food comes from. For example…while peeling a carrot, you can tell them that carrots grow underground. This may really fascinate them. You can tell them about all the people who helped bring your food from the farm to your table. Instead of turning on a show for your kiddos while you’re cooking dinner, let them grab a step-stool and spend some quality time with you in the kitchen. You’re teaching them about crucial life skills like the importance of real food. When they see you cooking, they’ll realize you care about food, and they should too. Looking for a fun activity for your kids? Sign up at the bottom of the page and you’ll have access to two scavenger hunts. One for the grocery store and one for outside play time. My kids can spend a lot of time looking at pictures in cookbooks. They like picking a recipe to make out of their cookbooks. When you give kids a say in the food they eat, they’re more likely to eat it! These cookbooks are all written with little chefs in mind. The Toddler Cookbook – A great book for toddlers and their parents to learn and cook together. The recipes in this book look super tasty. Forest Feast for Kids – We have this cookbook and our daughter LOVES looking through it. The artwork is beautiful, and the recipe ideas are super fun. The Science Chef– This book is full of fun kitchen experiments and projects for the science fan (or soon-to-be fan). Any time we let kiddos in the kitchen, we should be prepared for a mess. I find that when I expect a mess and I’m prepared to clean it up, it’s not such a big deal when it happens (because it WILL happen). Plus, when you can protect their clothes, that means less laundry for you! Colorful apron – Not only are these kid-sized aprons adorable, they do the job of keeping mess off their clothes. These have a pocket in front and an adjustable neck strap. You can also find a ton of options on Etsy. Chef’s hat w/ apron – If your kid really wants to look the part, get them this set with a white apron and a chef’s hat! Don’t forget to take pictures of your sweet young chef in this outfit. Smock – We have one like this, and it has been extremely useful for our messy activities. We use ours for crafting and cooking. It has sleeves and is waterproof. This will keep even the messiest toddler clean. Dish rags – Remember what I said about being prepared to clean up the mess? Well these dish rags are super absorbent. Keep a few on hand to wipe up any spills. So you’ve got the cookbook and the gear to protect their clothes. Time to get busy! These tools will help with your kitchen experience while you’re cooking with your kids. Of course, you don’t always need kid-specific tools to let your kids help. My four year old has started working the tortilla press all on her own! And when she sees me chopping vegetables, she grabs the step stool and her knife out of the drawer. She knows the drill! Little chef knife – Our oldest daughter was given one of these knives as a gift when she was three. Now, whenever it’s cooking time, she knows which drawer it’s in and tries to start chopping. Note: since this knife is made of plastic, and the intent is for it NOT to be too sharp, it won’t cut hard things without some serious effort. Rolling pin – Wouldn’t it be fun if your kid had their very own rolling pin? 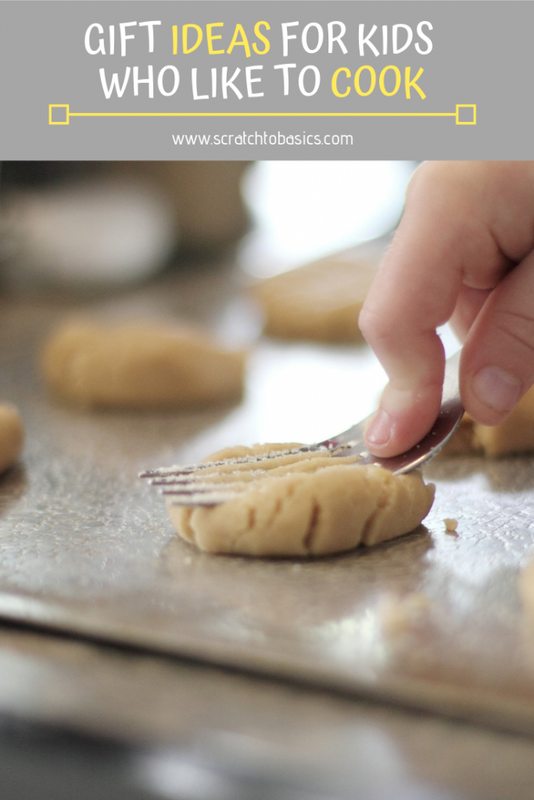 Just put them next to you, give them a chunk of dough to roll out, and be patient. This alone could keep them occupied for quite a while. Emoji cookie cutters – When we’re making sugar cookies or gingerbread cookies, the cookie cutter step is always a hit with my kids. I just found these emoji cookie cutters and they look so fun! Pastry brush – This isn’t specifically made for kids, but my kids love it. My toddler loves to just hold it and play with the bristles. If you want to use it as it was intended, kids can definitely help with that, too. Kid scissors – You probably have kitchen scissors at home, but mine are pretty sharp and I wouldn’t let my young kids use them. What if you had some kid scissors that you keep in the kitchen for those times that you want to let them help cut something…like lettuce or herbs? Here are a few options if you want to get a whole set instead of individual pieces. Any of these sets would make an awesome gift. Is there a kid in your life who enjoys pretend cooking with play-doh, or loves making food in their play kitchen? Those are future cooks, waiting to be given the chance to cook with you! Cupcake and decorating set – This set has cupcake making tools for beginner bakers. Let their creativity blossom with decorating cupcakes. Knife and cutting board set – This set includes two knives, a cutting board, and some recipe cards. This would make a great gift! Kitchen junior chef set – This 35 piece set looks awesome! 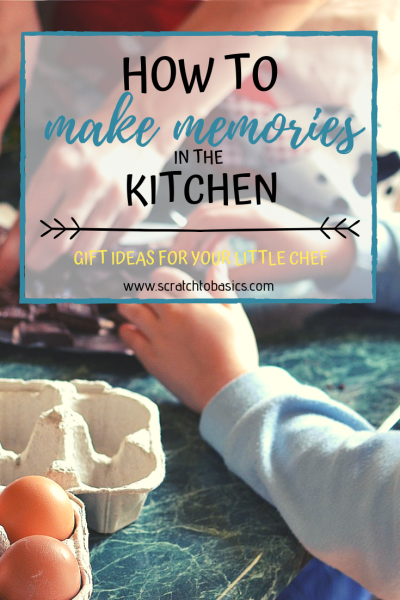 It has the chef apron and hat along with some helpful tools – cookie cutters, spoon, mixing bowl, and more. Intro to baking set – This 17 piece set comes with a rolling pin, a whisk, rubber spatulas, and more. Bring your kids into the kitchen to teach them valuable skills about where food comes from, and the importance of healthy food. And no matter how you do it, remember that kids are basically mess-machines. It’s how they learn. So embrace the mess! Don’t forget to take some pictures to savor the memories. Before you go, pin this for later! 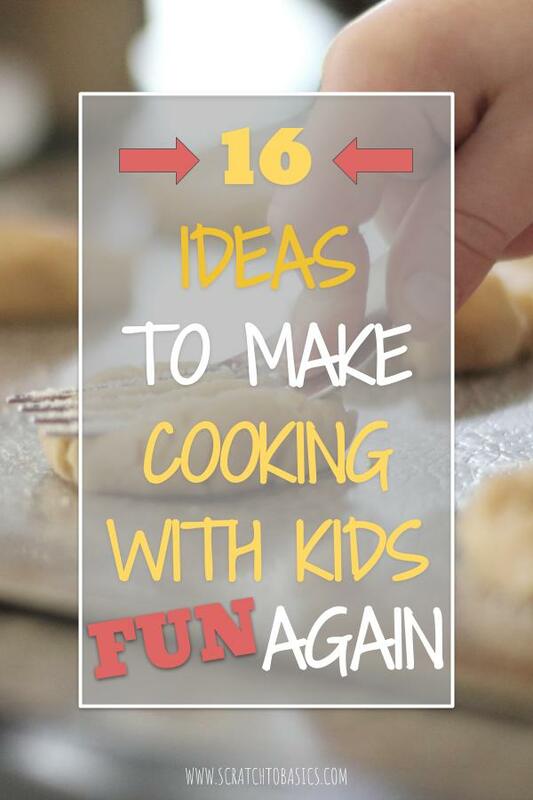 This is a great list, I’ve just started cooking more with my kids helping and you definitely gave me some good ideas! That’s great, Katie. I’m so glad you’re able to bring your kids into the cooking process. It’s so rewarding! This is a great list! I love having my daughter in the kitchen cooking with me. She’s a picky eater typically, but she’s much more adventurous when she actually sees the whole process. Mallory, I’m so glad to hear that. I feel the same way with my oldest daughter. It’s fun to see! This would be a great thing for homeschoolers. I love the science aspect of it. I think this is really fun, too. Yes, I totally agree Julie! There are so many teaching opportunities in the kitchen.